President Nicolás Maduro ordered his foreign minister to send a note of protest after the meeting held by 11 countries on Venezuelan migration. 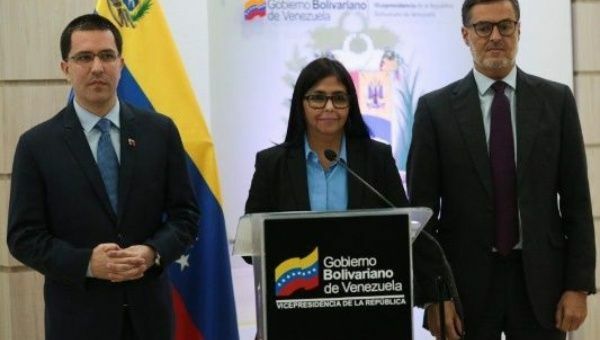 Sept 4 (teleSUR) The vice president of Venezuela, Delcy Rodríguez, noted that President Nicolás Maduro had ordered her to send a formal note of protest to the meeting that took place in Quito, Ecuador, for promoting xenophobia against Venezuelans abroad. The Venezuelan vice president indicated that the president ordered Foreign Minister Jorge Arreaza to send the note of protest after the meeting held by 11 countries in the region (Argentina, Ecuador, Brazil, Colombia, Costa Rica, Chile, Panama, Mexico, Peru, Uruguay and Paraguay) to deal with the migration of Venezuelans in the region. During the Quito meeting, the participating countries called for the opening of a humanitarian assistance mechanism. A fact that has been denounced by the Venezuelan authorities to carry out a possible intervention in the South American nation.